What is Zuppa Toscana Soup? Can I squeeze in one more soup recipe before winter flees and spring arrives to stay? We have been so sick this winter and I’ve been craving all of the soups. 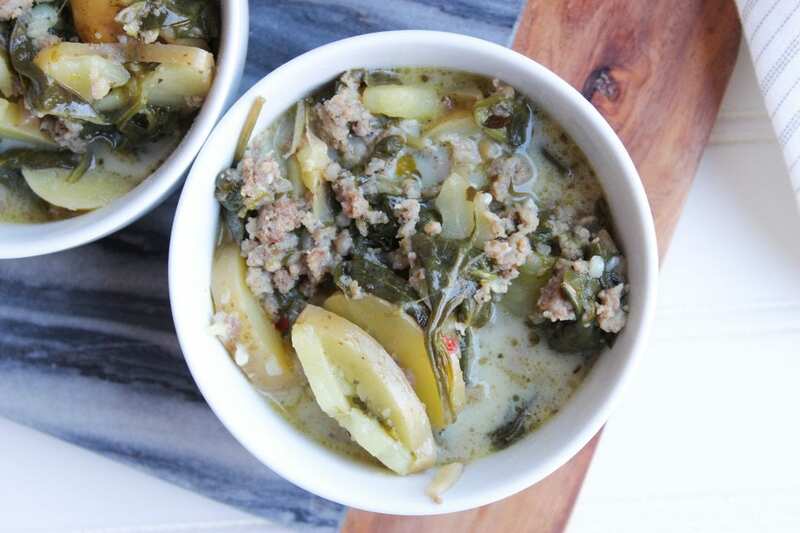 This Dairy Free, Gluten Free Zuppa Toscana Soup recipe has become a favorite of ours. When we experienced the first round of Flu A, my mother in law brought this over with homemade buttermilk cornbread and it just hit the spot. 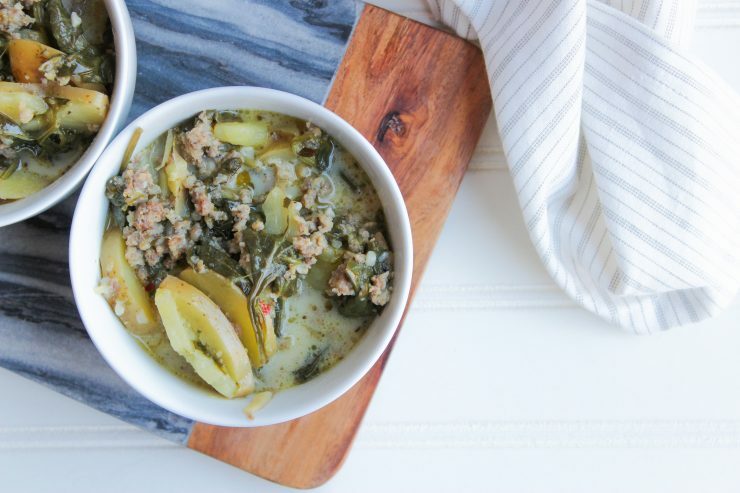 I had never had homemade Zuppa Toscana (can you believe that?!) and I was wowed by the comforting flavors. Spicy sausage, tender spinach and potatoes, warm chicken broth, and creamy milk made for a satisfying combination. Our second round of Flu, Flu B, hit a few weeks later and I decided to make this dairy-free version to enjoy. Since going Paleo a couple months back, I try to make sure that mostly everything we consume falls within those guidelines. 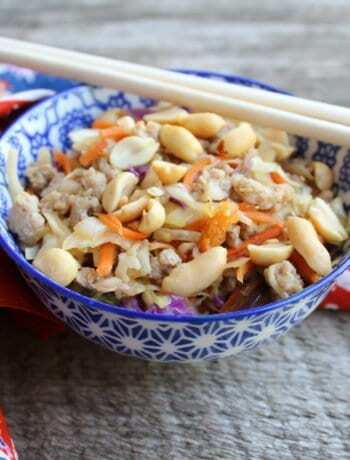 My husband has some nut allergies and tends to stay away from almond or cashew milk so cooking can be challenging at times. 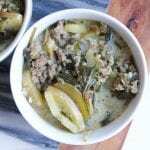 I saw various Paleo recipes on the web that used coconut milk in their Zuppa Toscana Soup, however, I didn’t want my soup to have a distinct coconut flavor. 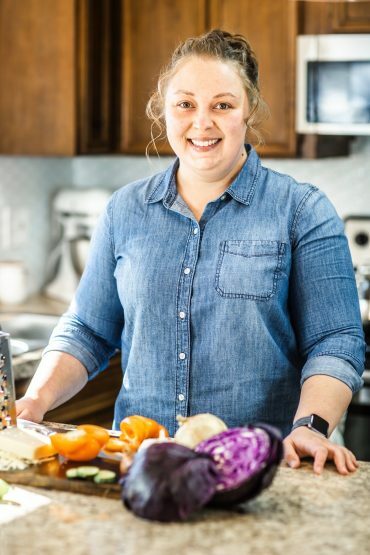 I chose to use plain, unsweetened soy milk in this recipe so that my husband could enjoy it with us, although soy milk is not Paleo compliant. If I were making it just for myself I would’ve used plain, unsweetened almond or cashew milk since either of those choices are healthier and Paleo compliant. 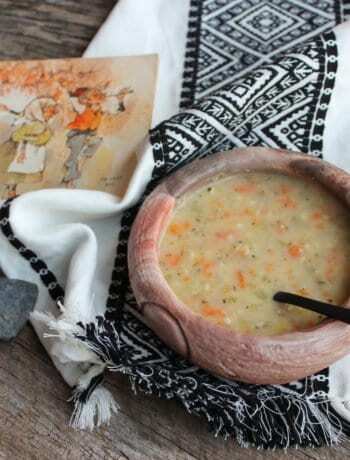 To make this soup, the first thing you’ll need is a Dutch Oven or a large stock pot. Place one pound of breakfast sausage (hot, medium or mild) in your pot and begin cooking it on medium heat. I’m using Tennessee Pride Original breakfast sausage here which has a more mild flavor. 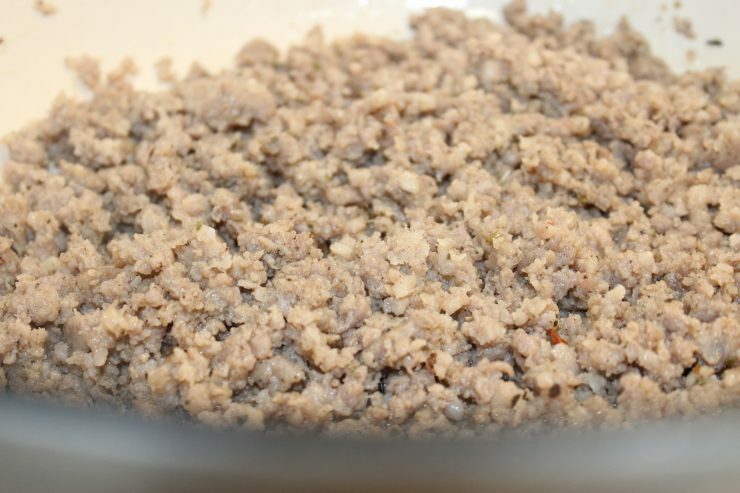 Use a spatula or meat masher to break the sausage into fine crumbles as it browns. You’ll also need 1/4 teaspoon salt, and 1/4 teaspoon of dried red pepper flakes. Stir the seasonings into the meat and continue cooking until the sausage is cooked through with no pink remaining. Pour in 48 ounces of chicken broth and add 1 tablespoon of ghee. Stir the ghee and chicken broth in until the ghee is melted, then add in 8 ounces of fresh spinach. 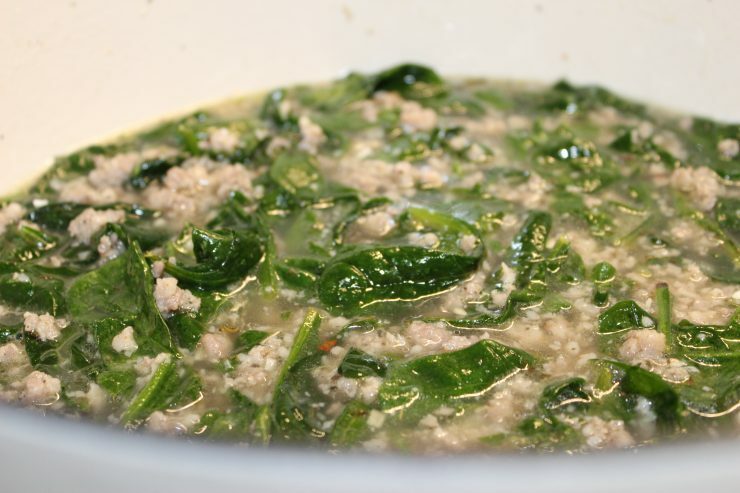 Some Zuppa Toscana soups use kale, but we prefer fresh spinach for a more tender, mild flavor. After adding in the spinach, slice one pound of baby, Yukon gold potatoes and toss them in. You could also use baby red potatoes but I prefer the buttery flavor of the Yukon Golds for this soup. 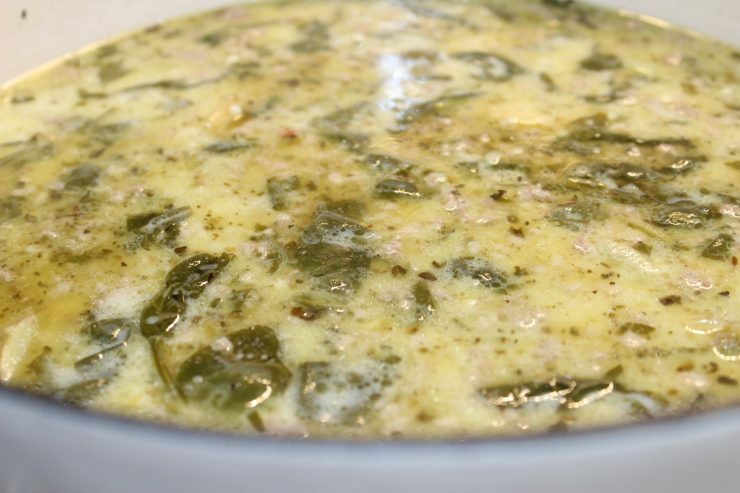 Bring the Zuppa Toscana Soup to a simmer, then place the lid on your Dutch oven or stock pot. 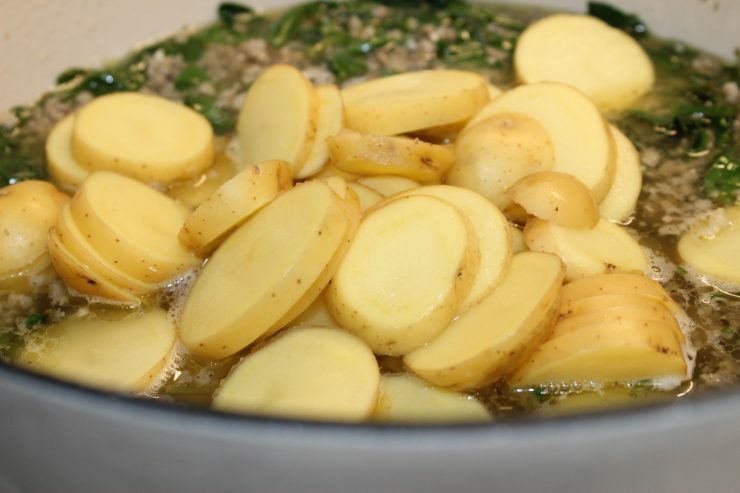 Continue simmering the soup for about 15 minutes or until the spinach is fully wilted and the potatoes are fork tender. Once the soup has cooked, remove the lid and reduce the heat to low. Give the soup a good stir and allow to cool for about 5 minutes. Once cooled somewhat, add in 2 1/2 cups of plain soy, almond, or cashew milk. For a full-dairy version, add in whole or 2% milk or heavy whipping cream. Half and Half cream can also be used. Dairy Free Zuppa Toscana Soup can be stored in an airtight container in the fridge for up to 5 days. This makes a great soup to take for work lunches and pairs wonderfully with crackers or Buttermilk Cornbread. Can Zuppa Toscana Soup be frozen? Yes, Zuppa Soup can be frozen, making it a perfect candidate for meal-prep. Place any leftovers in an airtight container and label the containers with the name and date it was made. To thaw, place in the fridge the night before and re-heat on the stove or in the microwave to enjoy. I like to place my freezer portions into one-cup containers, just freezing the portion I will eat when it thaws. This keeps me from having to eat soup for three days after it thaws, since you can’t re-freeze anything that’s already been frozen. 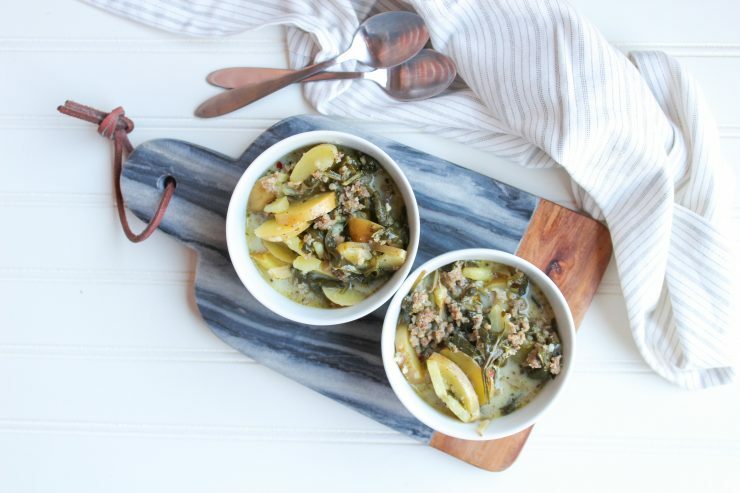 I hope you have enjoyed being in my kitchen today learning how to make this Dairy Free Zuppa Toscana Soup! 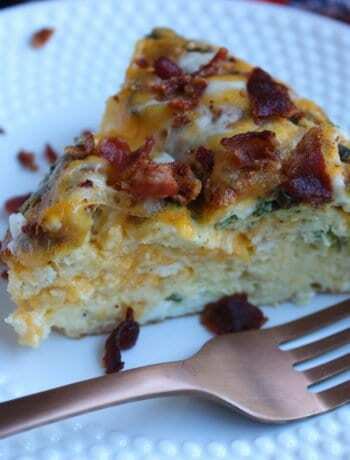 Please leave me a comment and rate this recipe once you try it; I love hearing back from you! 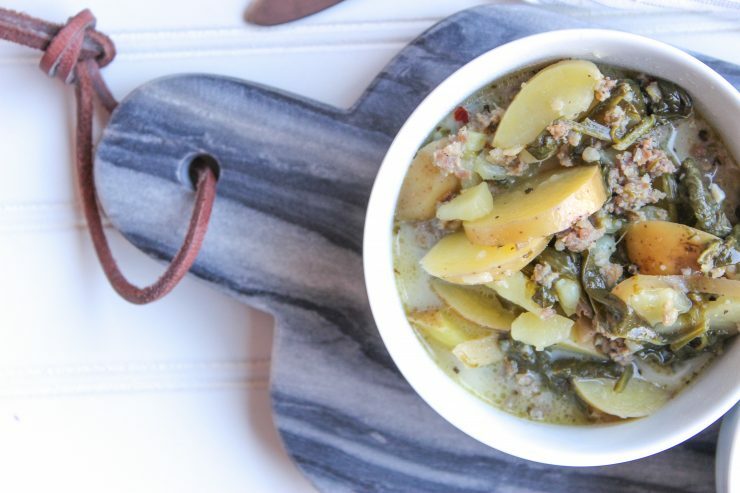 A delicious and Healthy Skinny Zuppa Toscana Soup, Paleo, Gluten-Free, and Dairy-Free. 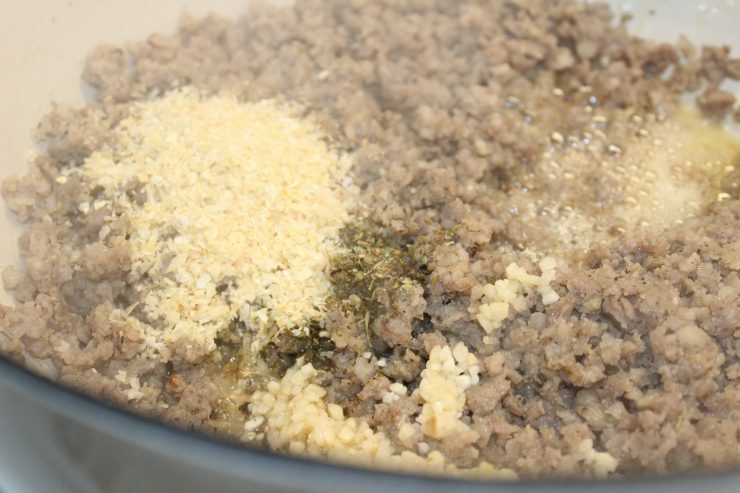 Place the sausage in a Dutch oven or large stock pot and use a meat masher or spatula to break it into fine crumbles as you brown it on medium heat. Cook sausage until fully cooked and add in salt, Italian seasoning, onion, garlic, and red pepper flakes. Stir to combine. Add in chicken broth, spinach, sliced potatoes, and ghee. Stir to combine. Bring to a simmer and place the lid on the pot. Simmer for 20 minutes or until the potatoes are cooked through and softened and the spinach is fully wilted. Once cooked, reduce heat to low and remove the lid. Allow the soup to cool for about 5-10 minutes, then stir in the soy, almond, or cashew milk. Nutrition information calculated using Tennessee Pride Original breakfast sausage and plain, unsweetened soy milk. 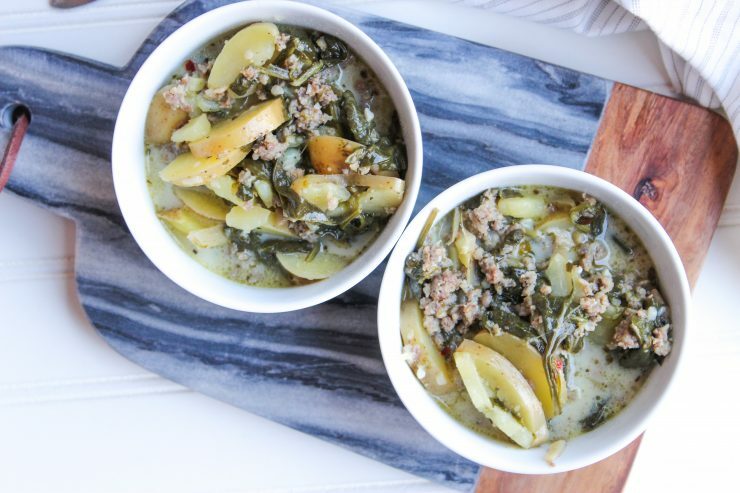 This looks like a great recipe for Zuppa Toscana Soup! Thanks so much for sharing with us at Full Plate Thursday and hope you are have a great week! Perfect for these spring days that can still be on the cold side! We had a cold snap over the weekend that had me craving this soup. I love this soup. Thanks for sharing at the What’s for Dinner party! Hope to see you next week too!